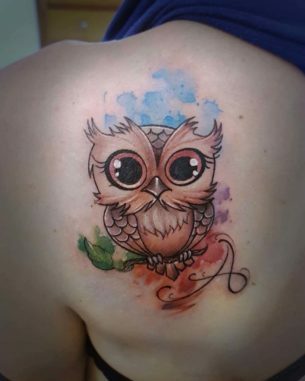 Shoulder blade tattoos is a very popular placement solution for a lot of tattoo lovers from all over the world. This particular spot is an ideal variant for men and women equally. 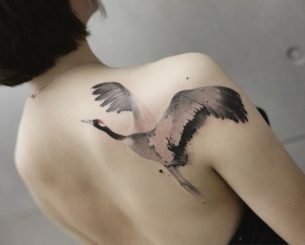 And the main and the greatest advantages of tattooing this area is a minimum of painful feelings during the process. 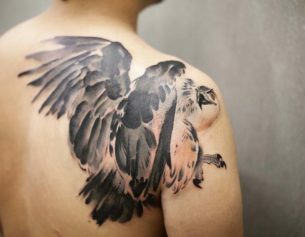 – First of all, shoulder blade is a very good area for tattooing cue to the fact that the skin surface here does not have obvious bends and unevenness and appears to be a perfect big flat “canvas”. 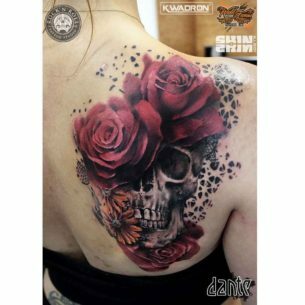 – Secondly, you can choose nearly any kind of shape and size of a tattoo design, as a drawing can occupy not only the surface of a shoulder blade but also spread to, for example, part of a neck, go down a back or even go to collar bones or chest. 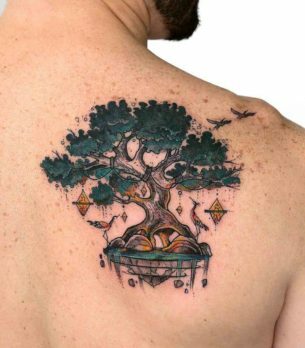 -The third and main advantage of this placement solution is relative painlessness of the tattooing process in comparison to many other body parts. There are not so many nerves and a lot of muscles under the skin of a shoulder blade which are the reasons why it commonly doesn’t ache so much. 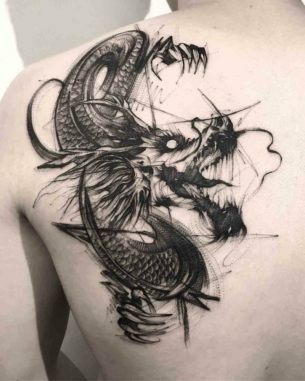 – Fourthly, another good side of the of the placement for a tattoo is that a body drawing can be easily hidden under any kind of clothes the same as to show it to others. 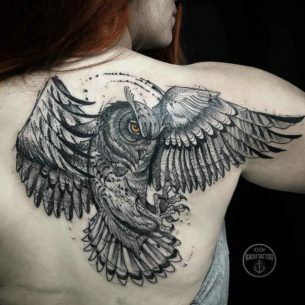 However, there is one important detail you have to take into consideration: once you’ve made a shoulder blade tattoo it would be very hard to locate another big tattoo on your back. 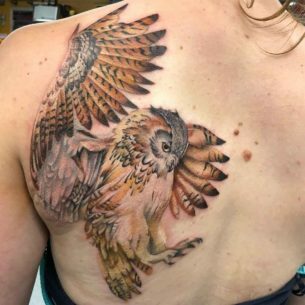 That’s why, if you are thinking of a possible perspective of making big back tattoo later, you should better not to have a tattoo on a shoulder blade, or at least make it temporary. 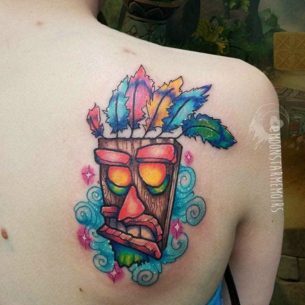 There are no limits towards the shape of the tattoo on that area, as it were mentioned earlier. 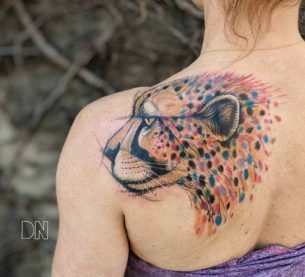 That’s why only the fantasy of the tattoo owner is responsible for the idea for a body drawing. 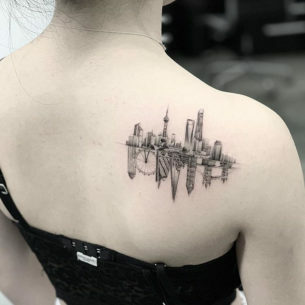 All these tattoos can be divided into two main groups or categories. 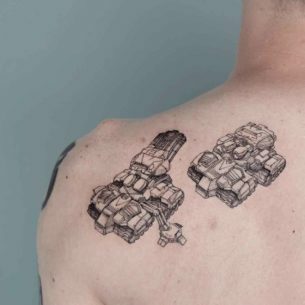 Symmetrical designs, when there are two identical drawings on both sides of a back. 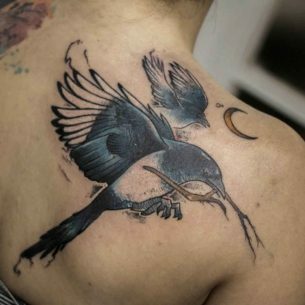 A good example of such ideas are, for example, wings tattoo ideas, however, it can be anything you like – birds, flowers, animals, abstract drawings etc. Thus, there are some restrictions of the design pick as not all drawings would look good in this variant. 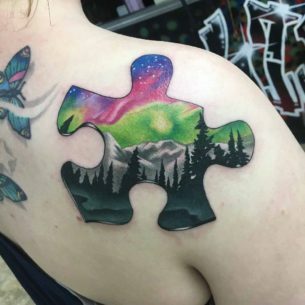 The other group contains tattoos placed only on one side. 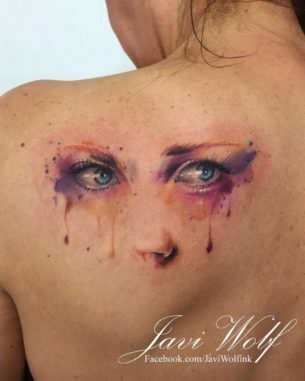 This variant leaves it all to the imagination of the tattoo owner. 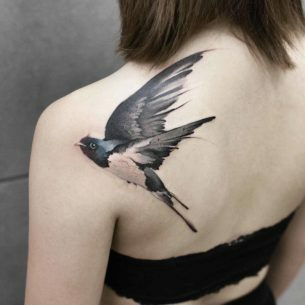 It is very hard to enumerate the most popular ideas for such tattoos, ‘cause they are infinite. 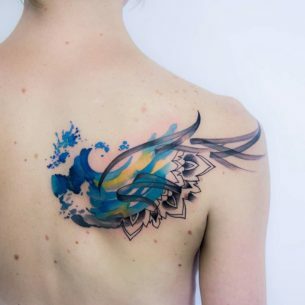 Shoulder blade tattoos are very popular among women, feminine designs are peculiar with a huge variety of choice, like butterflies, flowers, birds etc. which will not look so good on men’s body. 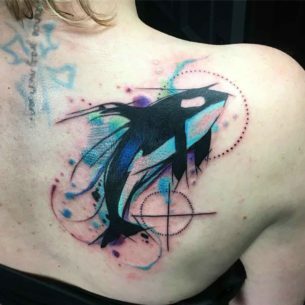 Brutal images or some unisex designs are recommended for men in this case, for example, letterings, hieroglyphs, abstract compositions.